Jimmy Cricket has paid a warm tribute to the late Liz Dawn in his monthly newspaper column. 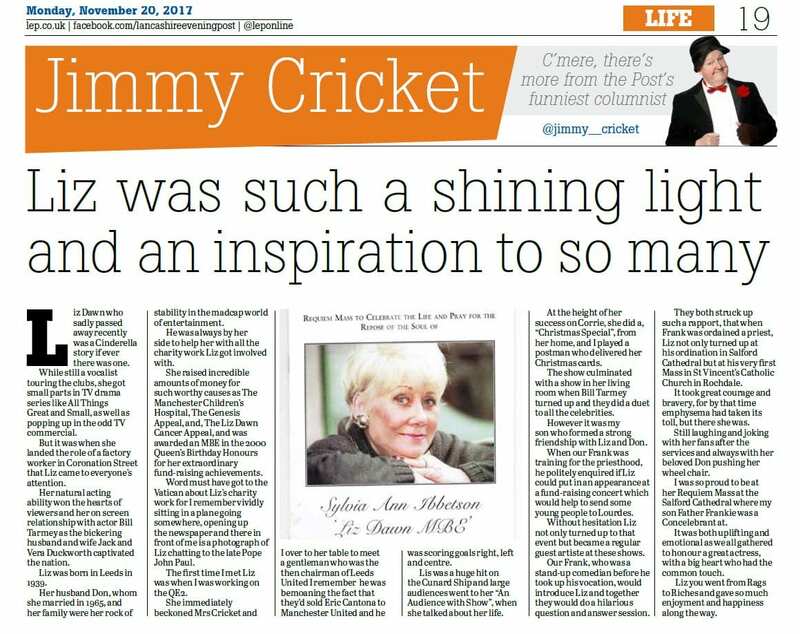 In the Lancashire Evening Post, Jimmy said Liz, who played Vera Duckworth in Coronation Street for more than 30 years, was “a great actress with a big heart who had the common touch”. The soap legend died aged 77 in September following a long battle with emphysema, a disease of the lungs that primarily causes shortness of breath. “It was when she landed the role of a factory worker in Coronation Street that Liz came to everyone’s attention,” recalled famous Northern Irish comedian Jimmy, 72. “Her natural acting ability won the hearts of viewers and her on-screen relationship with Bill Tarmey as the bickering husband and wife Jack and Vera Duckworth captivated the nation. Jimmy said he first met Leeds-born Liz while working on the QE2, adding she was a “huge hit”, with large audiences attending her ‘An Audience With Show’ where she talked about her life. “At the height of her success on Corrie, she did a ‘Christmas Special’ from her home, and I played a postman who delivered her Christmas cards,” reminisced Jimmy. “However, it was my son who formed a strong friendship with Liz and her husband, Don. “When our Frank was training for the priesthood, he politely enquired if Liz could put in an appearance at a fund-raising concert which would help to send some young people to Lourdes. “Without hesitation, Liz not only turned up to that event but became a regular guest artiste at these shows. “Our Frank, who was a stand-up comedian before he took up his vocation, would introduce Liz and together they would do a hilarious question-and answer-session. “They both struck up such a rapport that when when Frank was ordained a priest [in 2013], Liz not only turned up at his ordination in Salford Cathedral but at his very first Mass in St Vincent’s Catholic Church in Rochdale [picture above]. 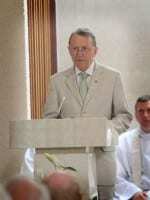 Jimmy added: “I was so proud to be at her Requiem Mass at Salford Cathedral where Father Frankie was a concelebrant. 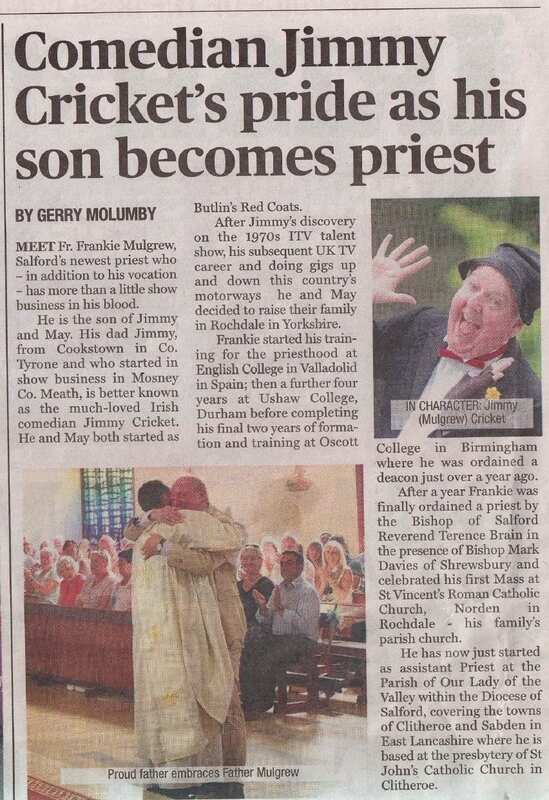 The Irish World newspaper has featured a special article about Jimmy Cricket’s second son, newly ordained priest Fr Frankie Mulgrew. It appeared in the 8 March edition of the Irish World, which is one of the main newspapers serving the Irish community in the UK. Fr Frankie, who was ordained to the Roman Catholic Church last summer, and his famous entertainer-dad can be seen on page 3 of the newspaper. 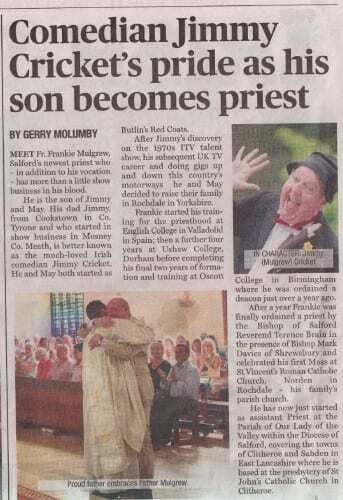 The article was written by Jimmy’s friend Gerry Molumby who lives in Nottingham and reports on how Jimmy is incredibly proud of his son, Frankie, becoming a priest. 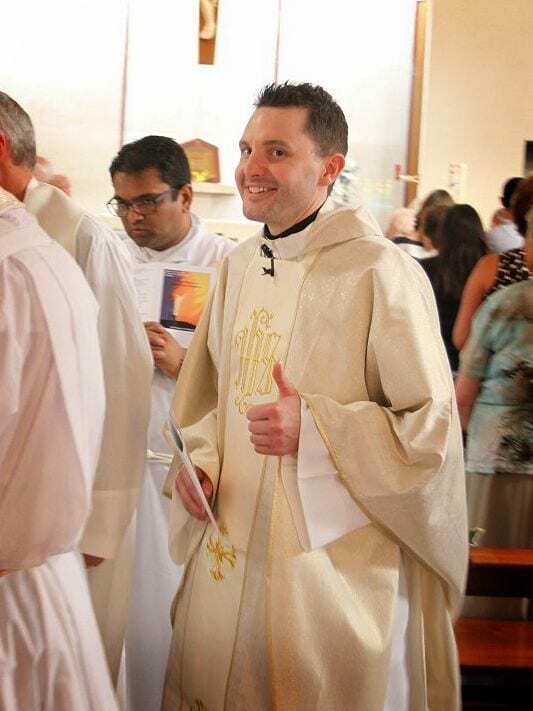 Fr Frankie – a regular entertainer before he was ordained – is described as having “more than a little show business in his blood”. It also provides some details about where he is currently undertaking his ministry – at the Parish of Our Lady of the Valley in East Lancashire. The ordination service took place at Salford Cathedral on the afternoon of Saturday 13 July 2013 and was presided over by the Rt Rev Bishop Terence Brain – Bishop of Salford – and in the presence of the Rt Rev Mark Davis, Bishop of Shrewsbury. 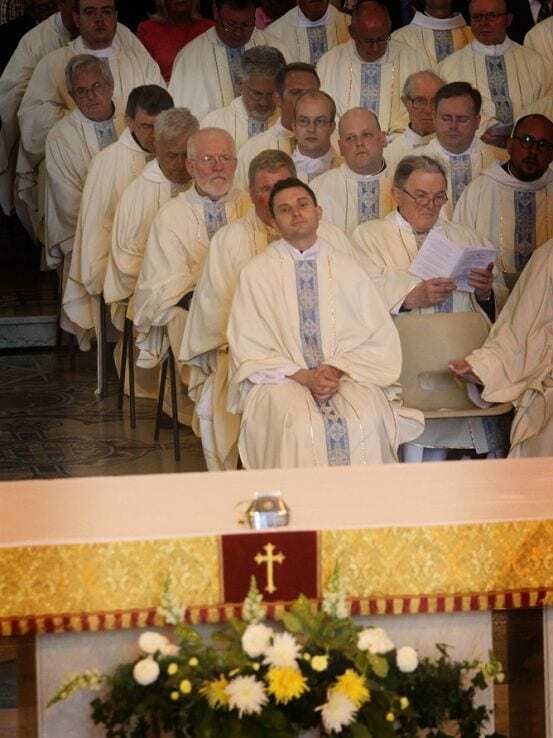 It was a joint ordination as Frankie’s friend, Nathan Horne, was also ordained to the priesthood and so the cathedral was packed with nearly 800 people in attendance. Fr Frankie’s first Mass was at St Vincent’s RC Church in Norden, Rochdale, the following day. 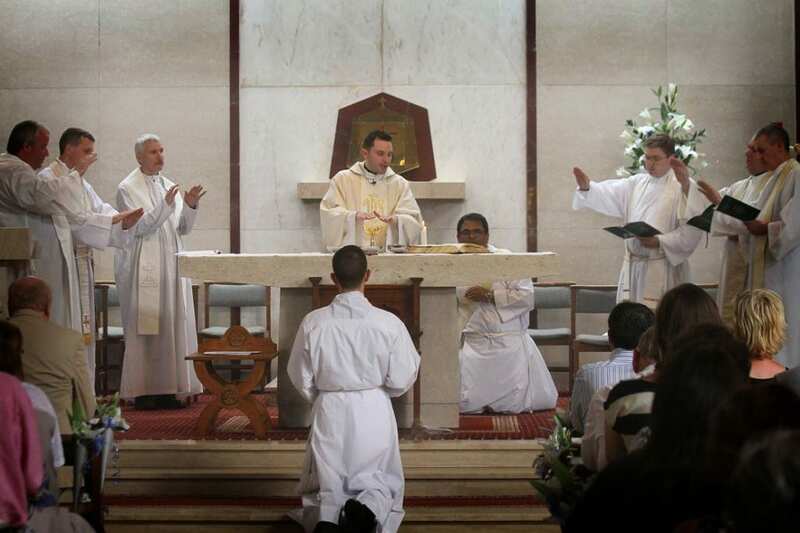 Frankie Mulgrew’s ordination to the Roman Catholic priesthood has received plenty of publicity in the media. 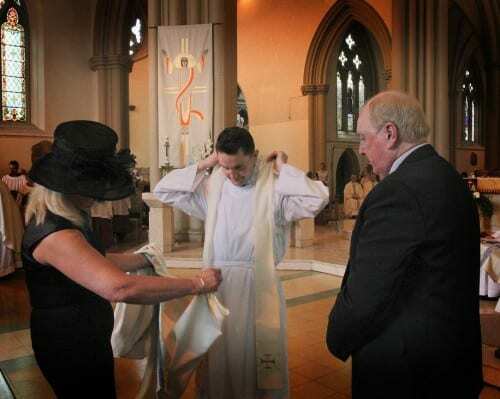 The 35-year-old younger son of Irish-born and Rochdale-based entertainer Jimmy Cricket became a priest this summer and among newspapers and websites to provide coverage of the special event was the Manchester Evening News which printed a news article (above). It included quotes from Fr Frankie who says he used to drive comedian Peter Kay to shows. Frankie, who has been a stand-up comedian in his own right, says one of his first parts in show business was “playing the back end of a cow at the Belfast Opera House”. 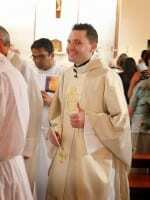 The newly ordained priest, whose stage name was Frankie Doodle, has compiled and edited a book called Does God LOL? (LOL is internet slang for Laugh Out Loud), which went on sale recently. Ken Dodd, Ricky Tomlinson, Tim Vine, Jo Brand, Milton Jones and the late Frank Carson are among the famous showbiz names to have contributed to the book, which is priced at £7.99 or less (and is available at all good bookshops and websites, including Amazon). Does God laugh out loud? 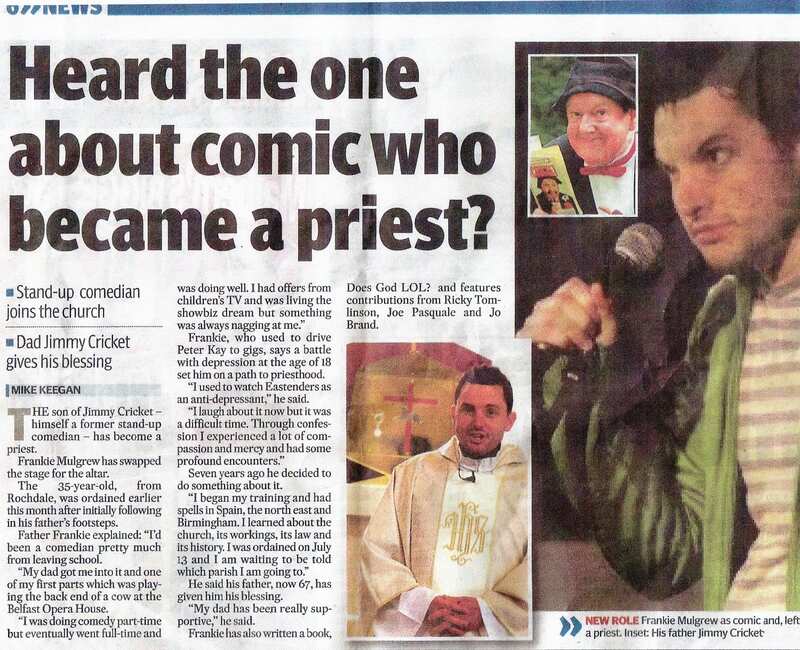 The comedian-turned-priest younger son of entertainer Jimmy Cricket has had a book published about God and humour. Frankie Mulgrew, whose stage name was Frankie Doodle, compiled and edited Does God LOL? (LOL is internet slang for Laugh Out Loud), which went on sale recently. Ken Dodd, Ricky Tomlinson, Tim Vine, Jo Brand, Milton Jones and the late Frank Carson are among the famous showbiz names to have contributed to the book, which is priced at £7.99 (and is available at all good bookshops and websites, including Amazon). The foreword was written by top theologian Tom Wright and there are cartoons from Dave Walker, Simone Lia, Mike Kazybrid and Robert Duncan. All proceeds from sales of the book will go towards the charity Mary’s Meals, an organisation which supports school feeding projects in some of the world’s poorest communities where hunger and poverty prevent children from gaining an education. Fr Frankie (above right), who was ordained a Roman Catholic priest at Salford Cathedral last month, dedicated the book to his dad – “for introducing me to one of God’s greatest gifts” – when he celebrated his first Mass, and presented him with a special copy. Does God LOL? develops a theme around whether the Almighty has a sense of humour, with an impressive array of well-known comedians, actors and performers – including Jimmy Cricket as well of course – all giving it some serious thought. The book is published by Darton, Longman & Todd. * Does God LOL? is clearly in demand: The popular Amazon website reported on 4 August that it had “only nine [copies] left in stock (more on the way)”, though there appears to be good availability again now (as of 11 August) – and it is currently available at just £5.99. Father Frankie Mulgrew had a special present for his dad Jimmy Cricket, the famous entertainer, when he celebrated his first Mass as a Roman Catholic priest. 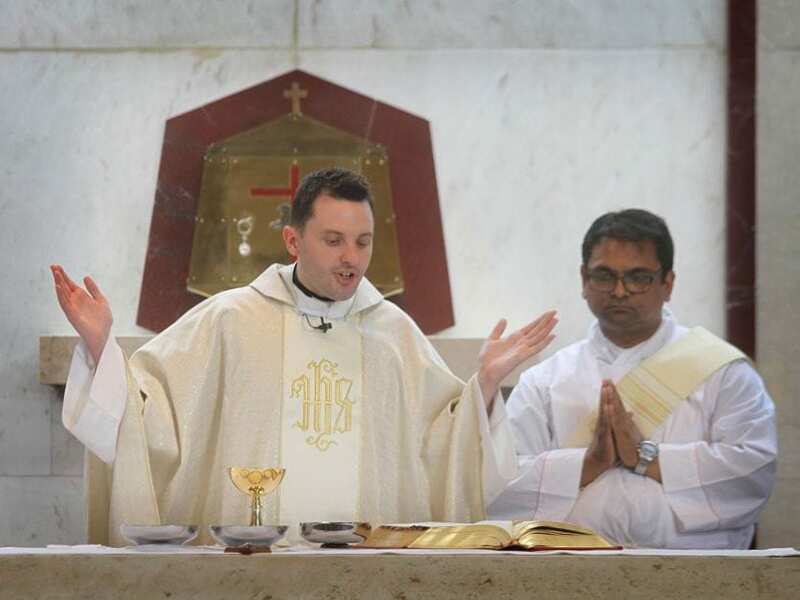 Having been ordained at Salford Cathedral the previous day, Fr Frankie said his first Mass at St Vincent’s RC Church in Norden, Rochdale, where has been based for several years. 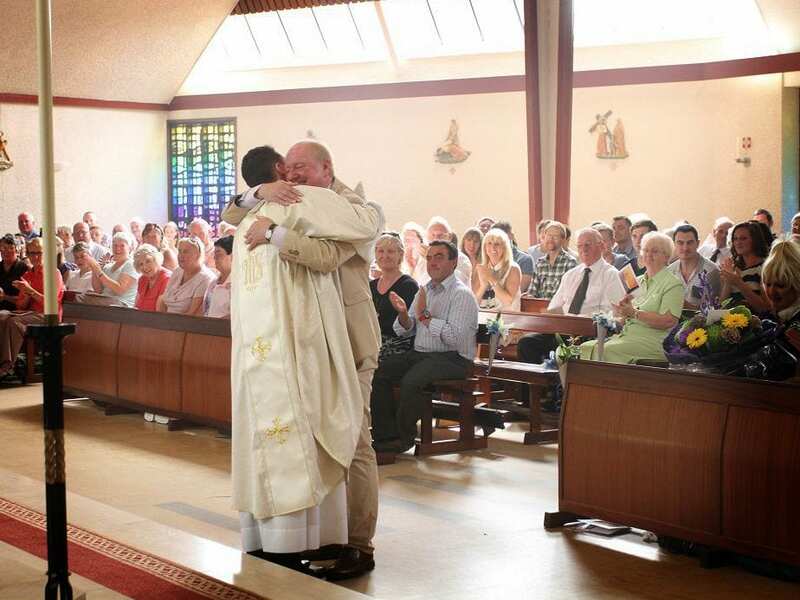 During the Mass, Fr Frankie – hugging his dad and thanking him for all he has done for him (picture above) – presented him with a special gift as a token of his gratitude… a copy of the book entitled Does God LOL? 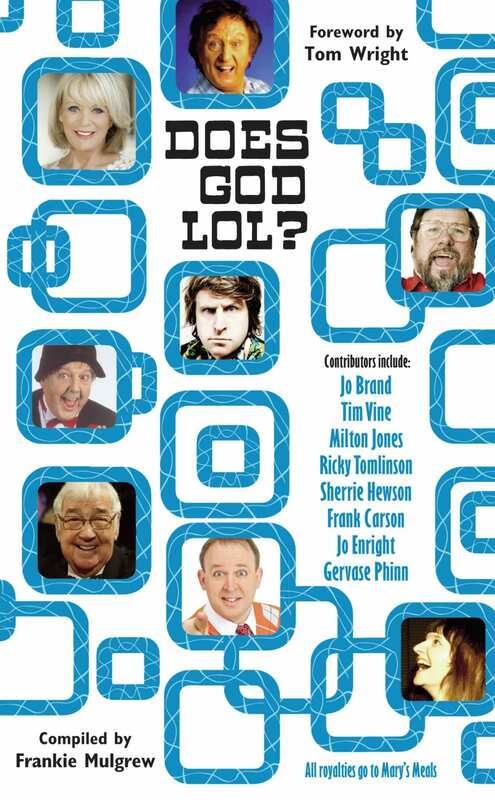 Frankie has compiled the book, which develops a theme around whether God has a sense of humour with the help of well-known contributors including Tim Vine, Ricky Tomlinson and Jo Brand. He dedicated it to his father who said he had no idea this was going to happen. Among the hundreds of people who attended the packed service at St Vincent’s was Liz Dawn, who played Vera Duckworth in Coronation Street. 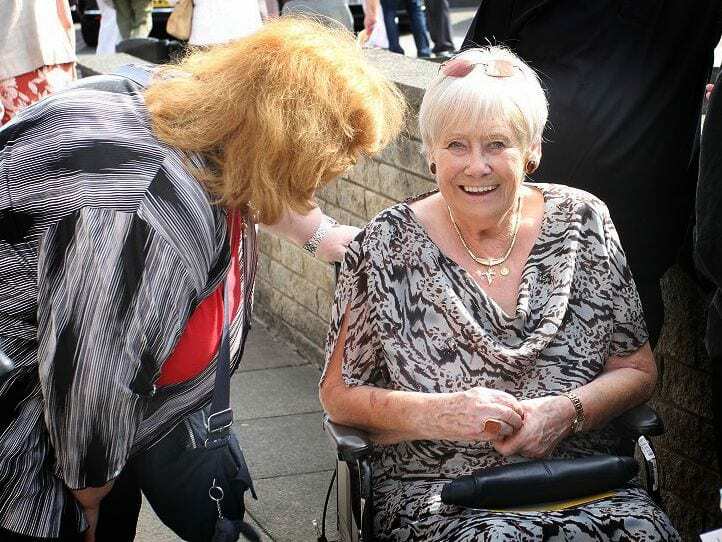 Above, she is pictured talking to another of Frankie’s friends, Liz Creagh, after the service. Liz Dawn was at both the ordination and the first Mass, and Frankie said he was really thrilled she had attended both events. 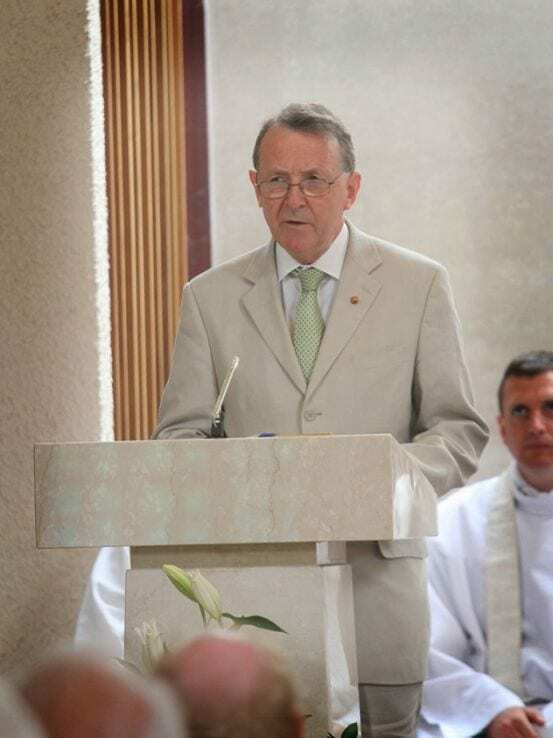 Lord David Alton , who has been a great guiding light for Frankie, read the first reading at the Mass (above). A buffet was held after Fr Frankie’s first Mass at St Vincent’s Parish Centre, which is just yards from the church. The ordination service, on Saturday 13 July, was presided over by the Rt Rev Bishop Terence Brain – Bishop of Salford – and in the presence of the Rt Rev Mark Davis, Bishop of Shrewsbury. Jimmy Cricket had a very proud paternal moment when his second son, Frankie, was ordained a Catholic priest in an ordination service at Salford Cathedral. The service on the afternoon of Saturday 13 July was presided over by the Rt Rev Bishop Terence Brain – Bishop of Salford – and in the presence of the Rt Rev Mark Davis, Bishop of Shrewsbury. The service was a very memorable one for many reasons, including the fact that the music and singing were provided by both a cathedral choir and a brass band. Jimmy and his wife, May, helped to robe their younger son for his ministry as a priest. 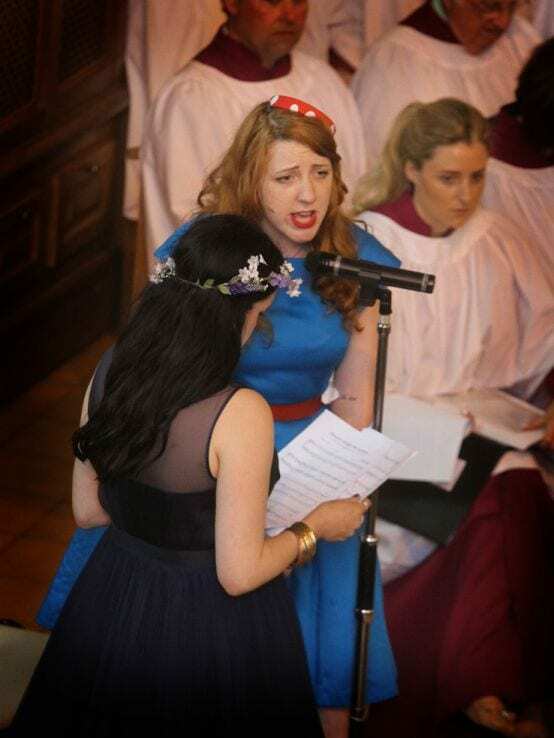 And their two daughters, Jamie and Katie, sang a reflection during the service. Apart from family and friends, there were guests present from the world of entertainment: the actress Suranne Jones (ex-Coronation Street) read the first reading and the singer Dana, who won the Eurovision Song Contest in 1970 – sang the Psalm. Also present was Don Maclean, Liz Dawn (who played Vera Duckworth in Coronation Street), Tim Vine, Lord David Alton, Mick Ferry, Alfie Joey, actor Malcolm Dixon and Stu Francis.